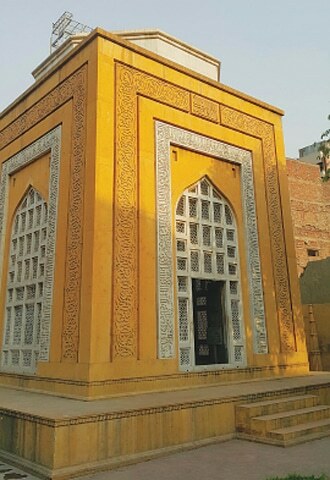 “Kheriyat (‘is everything okay’)?” asked the bearded man after giving me directions to Qutubuddin Aibak’s tomb from the famous Neela Gumbad Mosque in Anarkali, Lahore. “Perhaps people rarely enquire about Aibak’s tomb around here,” I said to my friend, as we mounted the motorbike to begin our journey. I had first read about Sultan Qutubuddin Aibak in my seventh grade textbook. I remembered him as a Muslim king who founded the Delhi Sultanate, who erected the Qutub Minar in Delhi and died while playing polo in Lahore, circa 1210 CE. Now, I was on the back seat of my friend’s motorbike, ‘jumping up and down’ — not merely out of excitement, but also due to the highly uneven road. We eventually turned towards Aibak Road, which was more like a narrow street, and were there in just a few minutes. In the midst of houses and shops, the tomb hid from our sight, the way this Sultan resting here is ‘hidden’ from public imagination. The tomb was built, in its present form, during the 1970s by the Department of Archaeology and Museums, Pakistan. Yellow stone was used for the construction, a marble dome was erected, emulating the Sultanate-era architecture. The walls decorated with carvings and calligraphy gave it a simple yet elegant look. The walls opposite the gate still have engravings resembling the Qutub Minar. Prior to this, the Sultan’s grave, in its simple form, was enclosed by residential houses. Whether the grave always existed in this form or whether it had a tomb built over it, is uncertain. Some historians claim that a marble dome did stand over it but was destroyed during the Sikh rule in Punjab. A small garden surrounds the tomb and an open entrance leads you inside the boundary walls. During the span of our visit only a few individuals visited, only to sit in the garden. As we entered the tomb building, I felt ‘awe’ at the thought of who lay in front of us! After reciting the Fateha, I sat next to the grave, recalling the impact Aibak and his succeeding dynasties had on this region. Qutubuddin Aibak was a slave from Turkistan (in present day Central Asia), and owned by Sultan Shahabuddin Muhammad Ghauri, who ruled parts of present day Afghanistan and Pakistan. The rights that Islam had introduced for slaves helped many slaves to later move up in the world and acquire high positions. Aibak, too, rose to become an able commander under the Sultan. During Ghauri’s expeditions to Punjab and North India, Aibak effectively commanded the troops, capturing large swathes of land. Ghauri’s epic battles with the Rajput ruler Prithviraj Chauhan are famous events from that era (Pakistan has even named missiles after ‘Ghauri’ in response to India’s ‘Prithvi’ missiles). Prithviraj was ultimately defeated. Impressed by the loyalty and services of Aibak, Ghauri started treating him like his own son. Upon Ghauri’s demise, the occupied Indian territories eventually came under the possession of Aibak, who became the first Muslim Sultan of Delhi — he was enthroned in Lahore though — thereby initiating the period that we now refer to as ‘the Delhi Sultanate’ (1206-1526 CE). Due to the successive ‘slave’ Sultans, the first period of Delhi Sultanate is also known as the ‘Slave Dynasty’. Aibak was among the Turks who had embraced Islam and adopted Persian language and culture (the ‘Turks/Turkic people’ originated from Central Asia and formed various powerful dynasties throughout history, including the Seljuks and Ottomans, who laid the foundation for modern day Turkey). 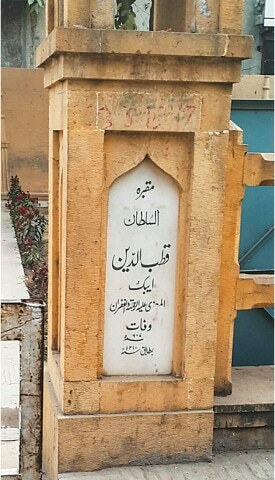 They revered the Sufi saints and were generally inclined towards the ‘Hanafi’ school (named after the esteemed Iraqi jurist Imam Abu Hanifa). Under the Sultanate, Hanafi and Sufi teachings gained notable influence in the Indian subcontinent, which continues till today. Revered Sufis such as Hazrat Mu’inuddin Chishti, Hazrat Bahauddin Zakariya Suharwardi and Hazrat Fariduddin Ganj-i-Shakar were from this era. Aibak initiated the construction of a Grand Mosque at Delhi. Though construction could not be completed, its magnificently built minaret, now known as Qutub Minar, attracts flocks of tourists to this day. 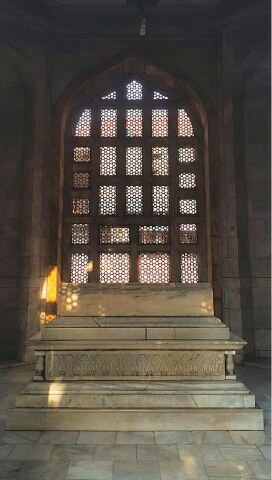 The Guinness World Record mentions: “Among minarets of earlier centuries, the tallest is the Qutub Minar.” Aibak eventually passed away while playing a horse game called Chowgan (which was later modernised by the British, who would call it ‘polo’), in Lahore (around 1210 CE) and was thus buried here. Aibak was ultimately succeeded by another Turkic slave and his son-in-law, Shams ud-Din Iltutmish. Iltutmish was the father of Razia Sultana, Delhi’s first and only female ruler. Thereafter, various Turkic (and some Afghan) Sultans ascended the throne during the Delhi Sultanate era, until the arrival of another Turko-Mongol dynasty from Samarqand (in present day Uzbekistan) — the Mughals (with Sultan Zahiruddin Babar laying the foundation for the Mughal Empire in India in 1526 CE). Upon exiting the tomb, my friend suggested we have jalebis from across the road. ‘Jalebi’, a popular sweet in India and Pakistan, was brought to this region by its ‘Persianised’ Turkic rulers. A number of other mouth-watering dishes came alongside it, including Kabab, Pulao, Gulab Jaman and Koftay (the origin of Swedish meat balls being the Ottoman Turkish ‘Kofte’ was a noteworthy discussion in some Western newspapers recently). ‘Jalebi’, a popular sweet in India and Pakistan, was brought to this region by its ‘Persianised’ Turkic rulers. Due to the sultans’ patronage of the Ulama (Islamic scholars), Sufis, Sayyids, historians, and poets, a number of resourceful people flocked to this region (especially around the 13th century, when the Mongols were devastating the rest of the Muslim world). Thereby, the seeds for a new civilisation were sowed. Today, we have various surnames in the subcontinent that remind us of their foreign origin, such as ‘Bukhari’ (from Bukhara in present day Uzbekistan), ‘Tirmizi’ (from Tirmiz, Uzbekistan), ‘Gilani’ (from Gilan, Iran), ‘Sherazi’ (from Shiraz, Iran), ‘Sabzwari’ (from Sabzawar in Afghanistan), ‘Gardezi’ (from ‘Gardez’, Afghanistan) and ‘Wasti’ (from Wasit, Iraq). The Turkic-Persian title of ‘Baig’ is also used by many. The legendary Urdu poet from Delhi Mirza Asadullah Baig Khan (d. 1869) and known by his pen name ‘Ghalib’, also claimed to be a descendant of the Turkic Aibak tribe. The ‘Persianised’ Turks from Central Asia also took Turkic, Arabic and Persian, with them to modern day Turkey. In the modern usage, ‘Turkish’ usually refers to the modernised ‘Turkic’ language of Turkey and ‘Turk’ generally refers to the inhabitants of Turkey; while ‘Turkic people’ is a broader term referring to a race that emerged from Central Asia and their languages are collectively called ‘Turkic languages’. Hence, even in the modern Turkish language we find words that are common with Arabic, Persian and, under their influence, Urdu language. For example, the words ‘Ayna’ (mirror), ‘Hafta’ (week) and ‘Namaz’ (‘Islamic ritual prayers’) are originally from Persian that are used in Urdu and Turkish as well. Arabic origin words such as ‘Insan’ (human), ‘Din’ (Deen; religion), ‘Kitap’ (Kitab; book) and ‘Cennet’ (Jannat; heaven — in modern Turkish, ‘c’ is pronounced as ‘j’ in English) are also used in Urdu and Turkish, likewise. However, certain similar sounding words may have a slightly different meaning since each language had its own course of evolution and development — for example, ‘Kahve’ means ‘coffee’ in Turkish (‘Kahve’ originated from the Arabic word ‘Qahwa’ and, through other European languages, is said to have become ‘Coffee’ in English) but ‘Kahva’ frequently refers to ‘green tea’ (or tea without milk) in Pakistan. The word ‘Urdu’ itself is said to have come from the Turkic languages wherein the word ‘Ordu’ referred to ‘a camp’ or ‘a settlement’ of the nomadic Turks and their armies (the English word ‘horde’ also originated from Orda/Ordu). According to the popular belief, Urdu got shortened from ‘Zuban-i-Urdu’ i.e. ‘the language of Ordu (the camp/settlement)’ which referred (in the latter Mughal era) to the Persian-, Arabic- and Turkic-influenced Indian language (Hindustani/Hindavi) that had evolved as the lingua franca in parts of North India and elsewhere; especially among the common people in the imperial Mughal army, who came from all sorts of backgrounds. The modern Turkish language still uses the word ‘Ordu’ to refer to the ‘army’ (‘Ordu’ also happens to be the name of a portal city on the Black Sea, in the ‘Ordu’ province of Turkey). From Turkic, Persian also uses ‘Ordu’ for a similar meaning and ‘Ordugah’ in Persian means ‘the (army) camp’ (mere ‘Ordu’ may even refer to ‘amusement/picnic’ in modern Persian, probably due to the ‘camping’ involved with some picnics). Posted on December 23, 2018 January 25, 2019 by Sayyid TalhahPosted in Afghanistan, Anthropology, Arabic, Bangladesh, Cuisine, Cultures, Dawn Newspaper, Education, Etymology, History, India, Iran, Islam, Languages, Learning, Pakistan, Persian, Sufis, Sufism, Turkey, Turkish, Urdu language, UzbekistanTagged Aibak, Anarkali Lahore, Arabic and Urdu, Aybak, Cafe, Coffee, Ghauri, Ghori, Ghouri, Historical links between Central Asia and Pakistan, Historical links between Pakistan and Turkey, Historical places in Lahore, Iltutmish, Jalebi, Kahva, Kahve, Koftay, Kofte, Ordu, Ordugah, Origin of the word Coffee, Persian and Urdu, Pulao, Pulav, Qahwah, Qutbuddin, Qutub Complex Delhi, Qutub Minar, Qutubuddeen, Qutubuddin, Qutubuddin Aibak, Sultan, Sultan Aibak, Sultan Ghauri, Sultan Iltutmish, Sultan Qutubuddin Aibak, Turkic Persian influence in India, Turkish and Urdu, Turkish Arabic Persian Urdu, Turkistan, Urdu, Uzbekistan. Next Next post: ‘Fake quotes’ pandemic: Don’t always believe what you read! Thanks for sharing with us it’s really nice article.